Gold refining process is intended to purify various precious metals to their purest form by separating and extracting alloy materials used in the manufacturing process. This article will describe top 10 interesting facts about gold refining process. 1. Before any gold refining process could take place, a professional precious metal expert needs to subject all pieces to careful assaying or in layman’s terms testing. Testing is necessary to determine exact gold or other precious metals composition and purity. Various methods of assaying are used ranging from professional fire assay to a basic scratch and touch method. 2. There are 2 major types of gold refining process that are used in the world, namely, Wohlwill and Miller processes that take their name from the names of individuals who invented them. The first method produces higher grade precious metal and is used by most refining agencies. 3. 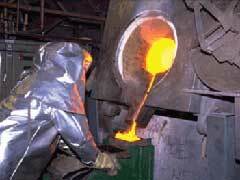 The next stage of gold refining process is done with the help of an induction furnace and chlorine gas. Under these special refining circumstances lighter alloy metals like copper and nickel are raised to the top and removed. 4. Smelting process allows separate pure gold from any other metals and are used in gold bullion refinery methods where you need to receive the purest forms of gold like, for example, in PAMP Suisse gold bullion or South African Krugerrand gold coins. 5. Once the metal has been put through final stages of gold refining process and purified to its finest form of 24 karats, gold bullion bars are produced. These are later sent to various coin and jewelry manufactures like, for example, Australian Perth Mint. This is an excellent online place to not only buy gold bullion bars but coins and all kinds of memorable silver, gold and platinum jewelry. 6. If you would like to be able to test your own jewelry for karat value, you can purchase gold testing kits online that consist of touch stones, nitric acid and special karat needles. 7. Nitric acid test helps determine karat composition and could be easily performed by anyone at home. Drop nitric acid to an indented portion of your jewelry piece and watch chemical reactions. If you see rusty bubbles on the surface, it’s definitely a 10K piece, in case there’s no chemical reaction, it’s likely to be a 14 K piece or higher. 18 and 24 karat pieces will not produce any obvious results and need to be taken to a professional refiner but at least you can get a basic idea of what you are looking at. 8. Magnet is perhaps the easiest and most basic tool that can be used at the beginning stages of the refining process to test whether it’s a solid or a plated piece of metal, While solid gold will never be attracted by a magnet, a plated object will become magnetic since it usually has major steel content. 9. Gold refining agency is the absolute best place to sell your precious jewelry to due to precision, honesty and ability to exchange your scrap gold pieces for gold bullion or get money right away. 10. You are generally better off to stay away from any mail in refinery places to avoid scams and getting ripped off. Locate your local gold refining agency and visit them directly.